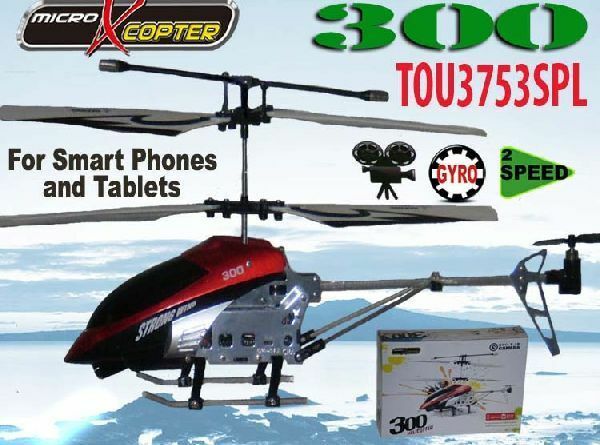 The Micro X Copter Model 300 is a medium Infrared 3 channels helicopter approximately 11 inches long and is an upgrade versions of the Micro X Copter. This Helicopter allows you to use with your smart phone or tablet and you can take video and photos in the air. The Micro X Copter Model 300 is fabricated with high impact alloy materials. The Micro X Copter Model 300 with Gyro is an indoors helicopter. WARNING: Adult supervision is required at all times.